The newest evolution of Omega's highly regarded SeaMaster series, the Aqua Terra delivers bold sporty styling and superior performance, on land or at sea. This model, sized for women, features a highly legible silver dial with luminous hands and markers, a luminous sweep seconds hand and seconds indexes, and a date display at the three o'clock position. The dial is set in a round brushed steel case and capped with a scratch-resistant sapphire crystal. An attractive and durable steel link bracelet completes the look. 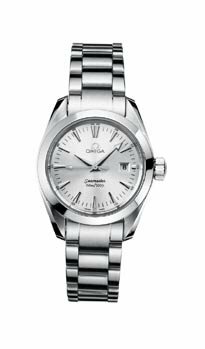 Other notable features of this Omega watch include Swiss quartz precision and water resistance to a full 150 meters.